Andy Montero is Chef/Owner of Montero’s Restaurant Bar and Catering, voted best overall restaurant in Elizabeth City, North Carolina multiple times. Andy Montero is Chef/Owner of Montero’s Restaurant Bar and Catering, voted best overall restaurant in Elizabeth City, North Carolina multiple times. 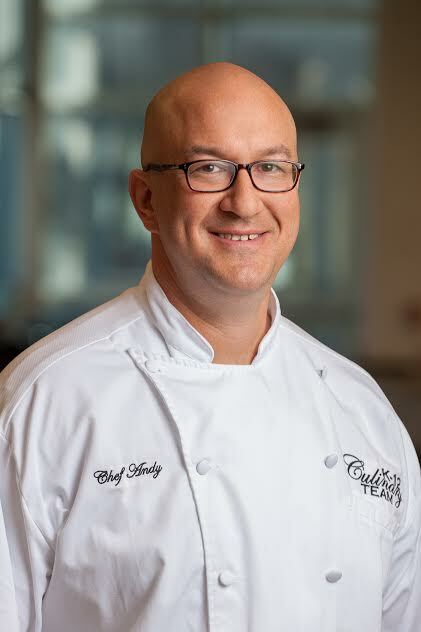 Chef Andy is a graduate of Johnson and Wales University where he was a culinary arts instructor as well as at the Culinary Institute of Virginia. He is co-founder of Safe Schools Fund of Elizabeth City, North Carolina, a charitable organization to provide funding for safety and security of his local school district. He is a current member of Albemarle Hospital Foundation Rotary, Knights of Columbus, and Elizabeth City Tourism. When he isn’t operating his restaurant or devoting to many charitable organizations, he loves spending time with his wife and three daughters. Where do you get your ideas from? How do you get your inspiration for new items? Just recently we have added on a Plant Based Menu for our healthy conscious guests. The menu has 8 items specifically designed without any animal products to help add variety to the handful of vegan options we already have on our full menu. This addition came about due to the increased interest from our staff! Many of them, including myself, have begun health regiments over the last 12 months to include both exercise and diet. It seemed like a perfect fit to help encourage this new “team” approach to both personal lives and work with a menu that they would all be comfortable eating themselves and recommending to our guests. The Quick-Chee recipe that is included is our fresh take on a classic Korean “side item”. While the fermented version is absolutely delicious, we wanted to offer a variety that could be prepared quickly (no risk of running out of inventory) and better compliment the flavor profile on the tuna dish it accompanies. 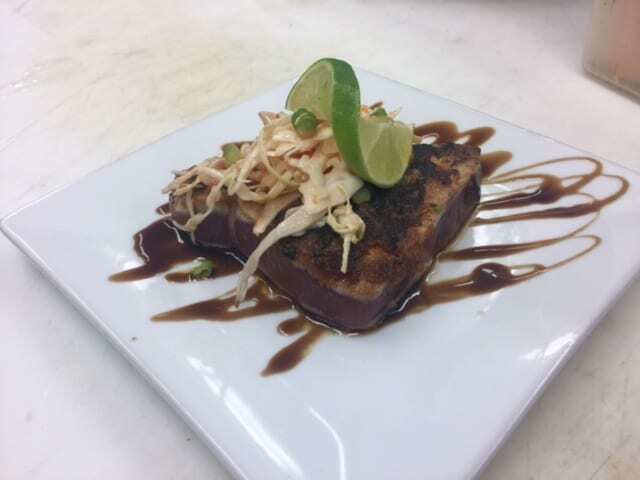 Our guests seem to really enjoy the heat, bit of twang from the fish sauce and crunch from the cabbage….and once paired with our Miso Tuna, the whole plate experience is a flavorful dance! What flavor trends influence your menu now? I actually use my staff for inspiration! 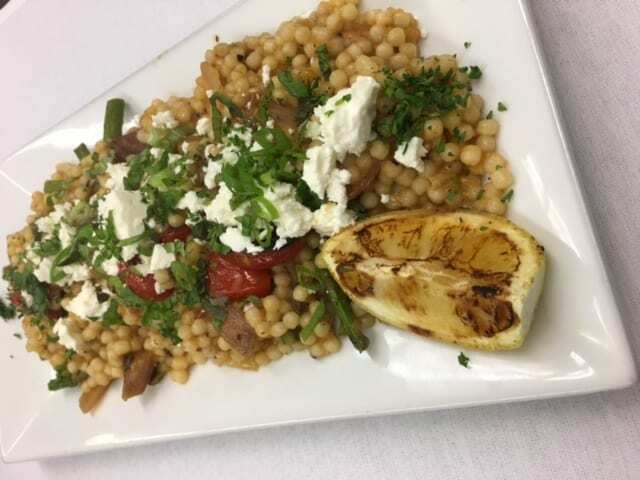 They are tasked each day with creating dinner specials and side items for our guests. They are all very diverse individuals with their own personal preferences, so when we all get together to discuss their nightly items, it brings so much to the table. We often take their creations and tweak them into menu items that help us build our catalog of items we rotate on and off 3-4 times a year. One of the things that I most enjoy about being a chef is how easily I can add to people’s experiences and memories. I speak with a lot of school groups about our industry and I enjoy sharing with them the fact that in a short period of time (it has happened to us in a 3 week period) we can prepare meals for a family bringing home a new baby, a small party for a school graduation, a wedding reception, a birthday and a funeral. Food is an integral part of everyone’s lives and because of that, I get to help people celebrate, mourn, share old memories and create new ones! It is absolutely the best part of what I do. This industry, specifically as an owner, has also allowed me to give back to the community. My wife Karin and I have create the SAFE Schools Fund (Safeschoolsfund.org) and use our restaurant to spread the word and raise money for our cause… providing security equipment and education to our local schools. We have the privilege of seeing so many different people come through our doors and use that opportunity to raise awareness, garner support and execute ideas and programs! What has been one of your biggest challenges in your career? One of the biggest challenges for me personally is balancing being a chef, owner, father and husband. At the start of our restaurant, I didn’t do a good job of changing one hat out for another… I was a chef all the time. I had to have structure (meaning things had to be my way! ), immediate results when I told people what to do and expected perfection. It didn’t take too long to realize that this kind of behavior and expectations would not work…anywhere! With the help of my wife, I have been able to come home and be a dad to my three daughters, giving them uninterrupted time and attention (and most importantly, patience). I have also sharpened my skills as an owner, increasing my communication skills and expectations form our staff and encouraging them with constant support. But most of all, I have learned to just be a better person. While I have always loved the work I do, I have allowed myself to enjoy the ebb and flow of this industry instead of letting it eat me up with frustration and stress….all possible because of a great family and staff! Who was your inspiration or mentored you along the way? Most currently, my mentor has been Chef Cyndie Story! She was brave enough to allow someone like myself onto her team and has been educating me in regards to school nutrition over the last year and a half. She has such a calming demeanor, patience with my silly questions and continues to encourage me to get more and more involved! Until we met, I had no idea that school nutrition was such a large part of our industry. Diving in head first has been exciting, rewarding and education for me and I am excited about the experiences still ahead! Charred Tomato CouscousI make these muffins for a client who has celiac disease and nut allergies. Her daughter has dairy and nut allergies. I use gluten free flour and there are chocolate chips that are allergy free. Everyone in the family can enjoy these and not feel deprived.